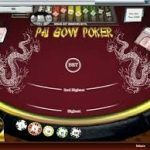 Pai Gow Poker is dealt by the standard rules. Conveniently, there is a house way button. The player isn’t able to spoil his hand because the game won’t let the player choose a low hand that is better than the high hand. 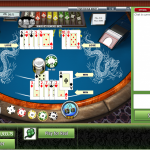 As usual with online pai gow poker, the dealer is always the banker. Assuming the player plays the house way, the house edge is 2.72%. Under optimal strategy it is 2.51%. Pai Gow Poker is played using a 53 card deck including a joker. 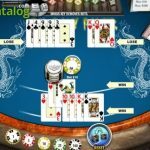 The object of this game is to beat the dealer and to actually win you must beat both of the dealer’s hands! If you only beat the high hand the game is considered a push.